Richard Mille and Airbus Corporate Jets (ACJ) share more than simply many of the same clients. As the two companies prepared to launch a watch together they took inventory of their commonalities and found that they extend to very technical details like, for example, screws and certain high-tech materials. We spoke to Richard Mille Marketing Director Tim Malachard as his company launched the new RM 50-02 ACJ Tourbillon Split Seconds Chronograph, the watch borne of Richard Mille’s partnership with ACJ. They are all about technology, light aircraft, trying to push the limits in construction with composites, with titanium, he confirmed. We are obsessed with all these things as well, but on a smaller scale, he told us. Malachard explains more about these obsessions in the accompanying video and also highlights one critical factor that initiated the partnership between Richard Mille and ACJ: The jet company noticed that many of its clients were wearing Richard Mille watches. 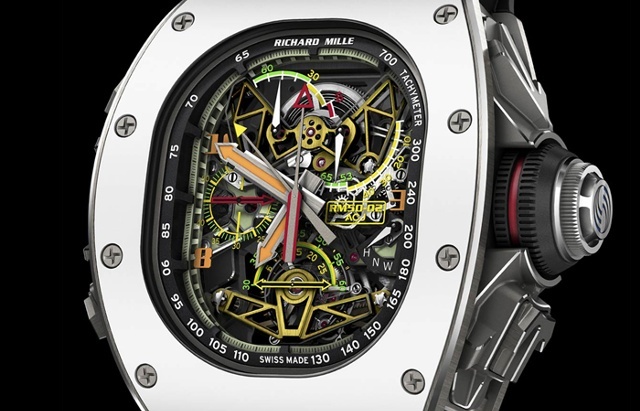 Malachard adds that Richard Mille utilizes carbon fiber technology to maintain ultra-light timepieces in the same way ACJ uses cutting-edge materials to create lightweight customized jets. Even the screws on the case of the Titanium-Aluminum (TiAl) watch are inspired directly from the screws ACJ uses to secure its aircraft windows. The ceramic bezel on the 50mm by 43mm watch is shaped to echo the look of an ACJ’s typical window shape. The TiAl case alloy is the same used by Airbus for its jet turbine blades because it demonstrates physical properties characteristic of a metal and mechanical properties resembling ceramic. This alloy is rigid while remaining lighter than most titanium alloys. 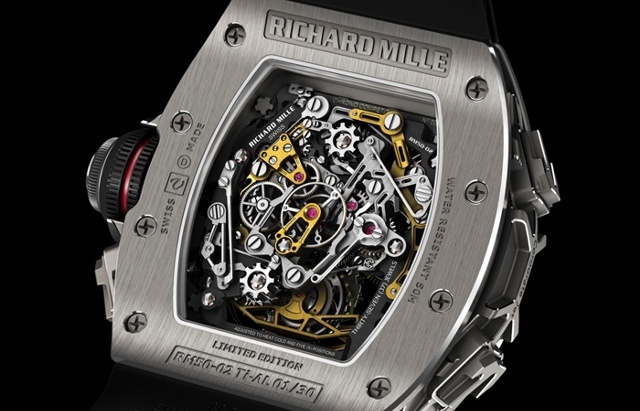 Richard Mille also maintains the watch’s feathery weight by utilizing skeletonized bridges. Both watch and jet also share their strong resistance to shock and environmental deterioration. Many of the watch’s movement parts have been coated with a distinctive aeronautical coating normally used to protect engine and chassis parts from corrosion and problematic environmental conditions. As a split-second chronograph, the watch offers numerous useful functions. The user simply presses the pusher at 4 o’clock to stop the split-seconds hand in order to read an intermediate time while the chronograph is engaged. Pressing the pusher again allows the split-seconds hand to rejoin the chronograph, ready for the next measurement. The new RM50-02 tourbillon caliber also hosts a power reserve indicator (70 hours) between 11 and 12 o’clock, a torque indicator that supplies information about the tension of the mainspring, and a function indicator to show the watch’s state in each of the positions for winding, neutral and hand setting. A careful examination of the watch’s crown reveals an engraved, wave-patterned Airbus logo. The RM 50-02 ACJ Tourbillon Split Seconds Chronograph is a limited edition of thirty pieces, only available in the Richard Mille boutiques.